The period between 1978 and 1990 creative writers and publishers moved away from each other. Publishers associated with the churches concentrated on religious publications. This period saw the proliferation of religious literature. Private publishers concentrated on non Papua New Guinean authors writing about Papua New Guinea. The Institute of Papua New Guinea Studies (IPNGS) shouldered some of the burden in the 1980s. The IPNGS published several series on oral history, short stories and poetry. The writers with their works in print during the 1980s were part of the Bikmaus tradition. Special issues of the Bikmaus journal featured Mark Hau’ofa’s The Bride Price of Hura and A Sequel to the Bride Price, William Tagis’s Weekend Melodrama and Michael Tsim, Abrosyius Waiyim’s The Flooded Sipi and John Kilburn’s King of Marbles. Single titles were Toby Kagl Waim’s Kallan, Michael Yake Mell’s Kumdi Bagre and The Call of Land and Joseph Aguang’s The Sorcerer, published either by IPNGS or National Research Institute. Others writers of this tradition include Rex Okona, Gideon Kinkawa, Bernard Kaspou, Adam Vai Delaney, Jack Lahui and myself. Books published in the 1980s include Paulias Matane (Aimbe series), Russell Soaba’s Wanpis (1978), Ignatius Kilage’s My Mother Calls Me Yaltep (1980) and all of John Kolia’s publication. 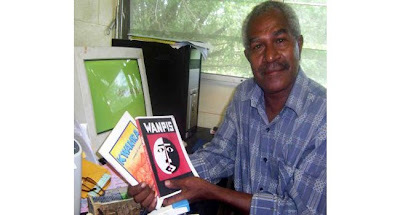 Kolia used the publishing funds of IPNGS to publish his own books, arguing that all attempts at writing the great PNG novel had failed in his time. In general writers were left in a limbo, to stand up on their own feet. The Grand Chief Sir Paulias Matane worked closely with UBSPD and CBS, an Indian publishing company, had many of his non-fiction books published with this company. The same company published books written by Arnold Mundua, Francis Nii, Lahui Ako, and several others. A number of us, including Regis Stella and myself, had our books published outside of PNG. Russell Soaba saw his second novel Maiba (1985), published by Three Continents Press in Washington, USA. Dellasta Pacific in Australia published Yauka Liria’s novel Bougainville Diary. Nora Vagi Brash published, Which Way Big Man-her collection of plays with Oxford University Press. Oxford University Press published several children’s books for lower primary school children. Several anthologies were also published at this time. Macmillan published Through Melanesian Eyes, compiled by Ganga Powell. Oxford University Press published Moments in Melanesia, a compilation of short stories by Melanesian writers, edited by Regis Stella. Stuart Watson edited an anthology of prose and poems by Goroka University students, entitled Lost in Jungle Ways, published by Dellasta Pacific. Adeola James edited a collection of writings by Papua New Guinean women in PNG Women Writers, published by Longman, Addison, and Wiley. Two anthologies: Lali (1980) and Nuanua (1996) edited by Albert Wendt featured a section on PNG writers. It seems Papua New Guineans are caught up on a pendulum of publishing supported (or not) by national and international publishing houses. UPNG Press published Tsomi by Matabuna Tahun, A Medal Without Honour by Nash Sorariba, and The Blue Logic by Wiri Yakaipoko. The Blue Logic was later published as The Dark Side of Port Moresby. The literary works published by UPNG Press were either funded by the authors or were funded by cooperate sponsorship. With the demise of UPNG Press, the Melanesian and Pacific Studies (MAPS) of UPNG began publishing several books and journals, among them Melissa Aigilo’s Falling Foliage, Regis Stella and Linda Maeaniani’s Melanesian Passages, and Zia Writers of Waria. As recent as 2008 a local printing company, Birdwing Printers began publishing several books targeted for primary school children. Local indigenous authors and foreign writers on Papua New Guinea still compete for the same attention with this publisher. Oxford and Dellasta Pasific (later Longman, Addison and Wiley) became the major outside publishers. According to Oxford University Press publishing PNG novels, poetry, or plays is a non-profitable venture. Oxford’s strategy is to publish educational resource books promoting the outcome based education, most of these written by non Papua New Guineans. Oxford has no intention of publishing original works of creative fiction by Papua New Guineans. Instead it leeches on works published in journals, anthologies, and other publications. How can international publishing companies promote a literary culture in Papua New Guinea when they do little to recognize the struggles of writers in this country? It is akin to the experiences of African writers in the 1950s and 1960s when major European publishing houses were more interested in maintaining a hegemonic status quo, visa-vise economic exploitation, rather than bridging the divide between European literary culture and postcolonial creative literary productions. Papua New Guinean writers need financial support to have their works published. In the last five years I observed that a number of Papua New Guineans have begun self-publishing their own books. Without the help of the government or international publishing houses a number of local writers have gone down this road. At face value, it appears to encourage local authors, but the ambitious journey for a self-published author in PNG is unpredictable and treacherous, if left alone. Russell Soaba self-published Kwamra: A Season of Harvest under Anuki Country Press; Yauka Liria and Stanley Liria published their books under Crossroads Publications, and Fegsley Risapi under his own company Bradwin. I self-published my third collection of poetry: A Rower’s Song, under my own publishing company known as Manui Publishers. I used my own money to have my books printed with a local printer. I have to make a lot of personal sacrifices to come up with enough money to have one book published. Life down this road is painful, yet fulfilling. Books and publishing are inseparable in a literary culture. If there are no publishing activities then no writing appears in print. Writers depend on publishing companies to see their writings in print and read by many people. Publishing works of fiction, poetry, and drama is still trapped in a time capsule. From time to time we see bubbles of this great energy escape the bottom to fill up the top of the jar. My name is Zachary Plante and I'm a student at University of Massachusetts Lowell and I'm currently taking a class that requires me to research another country. For my research I choose to research your country, Papua New Guinea and I'd like to set up an interview via email, if that would possible. It would be greatly appreciated if the interview could be set-up for either later today or tomorrow if possible permitting your schedule.